I'm always in awe when I watch the Olympics, NCAA Championships, World Championships, or even our own State Championship Track & Field meets. Watching these athletes perform at the highest level possible is what you dream about as a Track coach. So how about this... 19 NCAA Individual Championships, 12 team championships, Olympics Jumps coach, Level I, II and III as well as the Mater Coach Designation from USATF. Or what about the 11 NCAA national champions, 70 conference titles, 24 NCAA national qualifiers, 23 decathlon/heptathlon with five NCAA titles, 15 NCAA top 10 team titles. 10-time member of the US National Track Team, 2-time NCAA All American, over 150 TN state individual state champions, US Olympian and US Olympic Trial Decathlon Champion. AAU National champions, over 40 TN state champions, IAAF Level 5 and USATF Level 2 & 3 Certifications, Nike Indoor national champion. 13 TN state champions.... Ok, I'm sorry but I will have to stop here since this is going to go on for a very long time. That is a small collective list of the credentials of the Coaches that presented various topics at this years' T&F Coaches of TN Conference and Clinic. Yea, pretty dang impressive indeed! The Clinic started off on a Friday night with Boo Schexnayder going over an introduction to Training Design. Those of you not familiar with Boo, well, you should be. 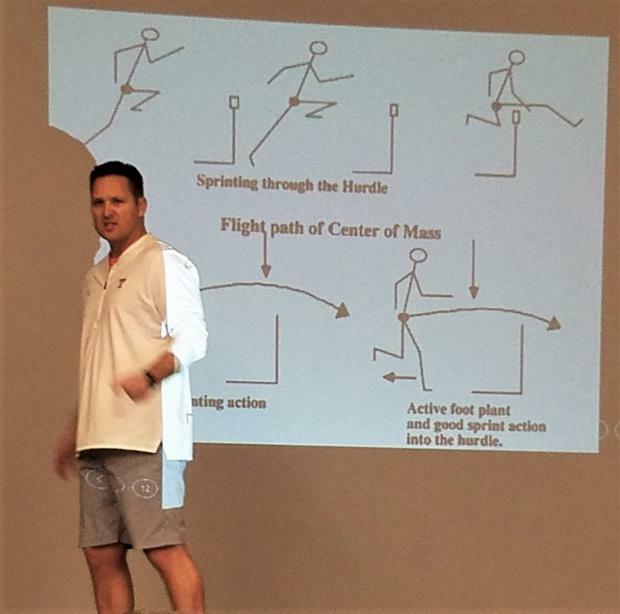 He's currently on the staff at LSU and for the past twenty or more years, has been known internationally as the world leader in Track and Field training design. A few minutes before Boo started his talk, the Hilton Garden Inn crew got busy adding more chairs and tables to the room. Apparently, the coaches attending this conference are the ones at the top of their game and certainly know when it's worth listening. 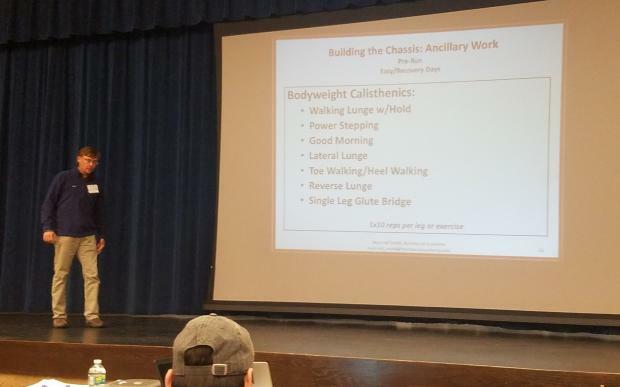 I'm not going to recap what the talk was about, but I've got a much better feel for grouping workouts, neuromuscular demand, duration of output, rest/restoration, and a lot more of the science of what we do every day. Amazing! 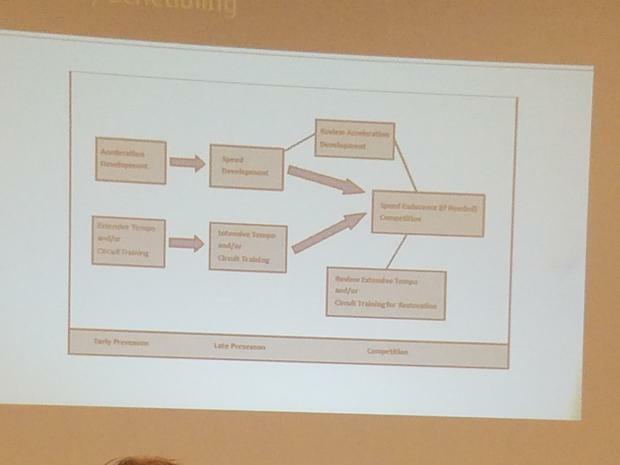 Then we went from the technical... well, the technical presented in a very easy to understand way... to watching Travis Geopfert (Associate Head Coach at UT) give the keynote address. I say watching, because Travis is not one to stand still or behind the microphone. He's also one that doesn't need a microphone. Excellence was the theme, enthusiasm was the mood... and excitement to train track and field was the result! If you sit through one of Travis' talks, that certainly won't be the time to check your resting pulse rate! Then a while with Jason Michaels, a superb entertainer known as the Cardshark. Card tricks and magic. Kind of reminds me of what it's like to be a Track and Field coach... making magic from things you might not think would be capable of magic. Great entertainment. And then the chance to socialize with fellow coaches completed out the first night of the clinic. Saturday began with the FCA Breakfast of Champions and then followed with your choice of 3 sessions each hour or so through the day. I almost thought I'd have to flip a coin on these sessions. Having to choose between three great choices five times during the day was a difficult task to say the least. Several times I wished I could clone myself so I can attend all three! Heck, I had to even choose between Chicken Pasta or a Tomato ziti for lunch!! Ok, I didn't, I had both. And a salad. And a roll. And yes, cookies too. Efficient Hurdle Clearance was one of the sessions I went to and the interaction between the presenter (Travis Geopfert) and everyone attending made for one heck of an informative session. Can't wait to start working everything. 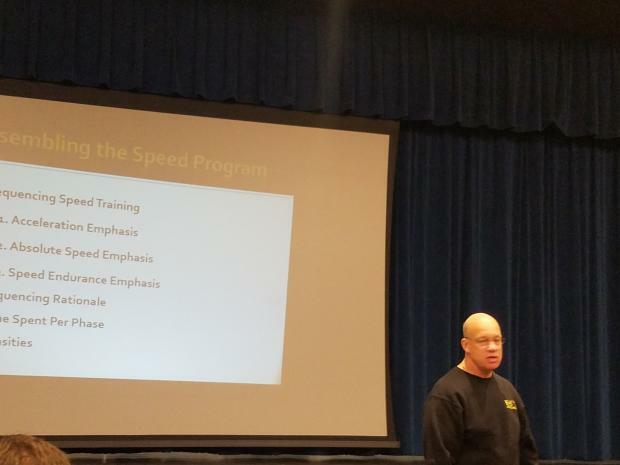 And learning speed development from Boo Schexnayder pretty much made me feel like I am going to have some really strong speedsters on the team this season! I also decided to sit in on one of the local speakers, Marshall Smith, from Brentwood Academy. Well, that may have been more of a spying kind of motivation. Wanted to see what the competition is doing! Ha! Actually, that's the beauty of this Clinic. We have so many coaches around us that are just happy to share, especially if they think they can help you make athletes better. We all want to see our TN Track and Field athletes excel... even if they are the competition! It's good for the athletes, and isn't that why we do this? I also sat in on an afternoon session on Effective Relay Techniques. Long time Nashville area coach, Andrew Reynolds did this session. I met Andrew a long time ago when he was meet director for one of the USATF summer meets. I needed to check in with him and I asked someone where I might find him. The coach I asked pointed at the middle of the 100M straight and said, "the guy with the mic". Andrew had the microphone for the sound system in one hand and the heat sheet for the event in the other. I think it was the younger age group 800 making their last lap. As the athletes streamed by him, he shuffled thru the papers and looking intently at each of the athletes going by. He looked busy. And that was because he was making sure he could call out just about every one of the kids names going by. Even the ones ahead of the ones he was coaching. He probably doesn't remember, but his comment to me later was that everyone needs encouragement when they're young and learning the sport. So I saw his name on the list of presenters and thought I needed some encouragement with my relay knowledge and attended his session. Start with 16 steps for the 4x100 exchange. Drop it to 8 steps for the 4x200 exchange... why... because you just can't practice that relay effectively no matter how hard you try. I like the humor. 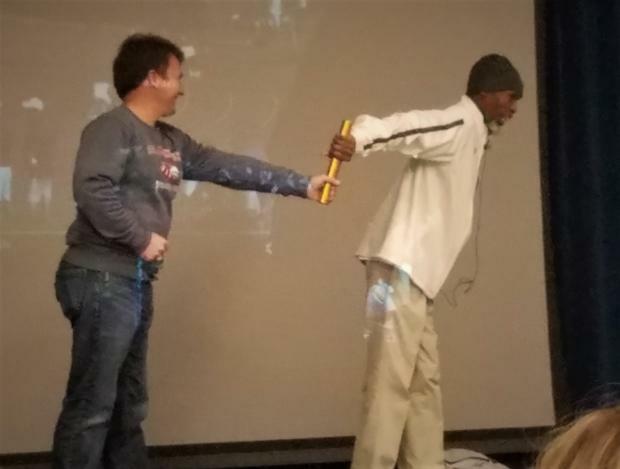 His whole presentation came directly from the audience. He asked what they wanted to learn about and then shared his expertise on that topic with everyone. Just like all the coaches at this clinic, he was there to share his knowledge with other coaches that wanted to learn the sport. And really, I'm a better coach because of that! Look out for this clinic and conference next year and be SURE you mark it on the calendar! Thanks Gary and your foundation for sponsoring this again and to all the sponsors and volunteers for another fantastic clinic. And a huge shout out to the coaches that attend... knowing we can all learn more each and every day is just going to make the sport of Track and Field in Tennessee all that much better as we continue on!